Here at Argyle Feed Store we make it our mission to shine the light on our outstanding customers with our Customer Spotlight. Many of our customers give back to the community, such as this month’s November 2016 Customer Spotlight Victory Therapy Center. Victory Therapy Center is a 501(c)(3) not-for-profit organization that provides services to improve the quality of life of individuals through equine therapy. Founded by Doug and Vivian Newton as Rocky Top Therapy Center in 1992, Victory offers the benefits of equine-assisted therapy and psychotherapy for individuals with physical, mental, or emotional disabilities and challenges. For many years the operation was located on a working ranch in Keller, Texas. In 2013, an opportunity was identified to relocate to the town of Roanoke and build a new facility to expand its service offerings and have an even greater impact on the lives of its clients and their families. 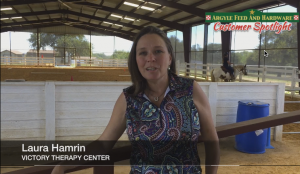 Argyle Feed Store’s outside sales person, Kaylan Herbst, visited with Victory Therapy Center in October where she and Laura Hamrin shot this quick video. Kaylan will visit your ranch and offer’s a free assessment of your animals – from pets to ranch animals – on how to get the most out of the feeds you purchase. Argyle Feed Store also offers free feeding trials. Interested in talking to Kaylan? Find out more here. This entry was posted on Sunday, October 30th, 2016 at 4:47 pm	and is filed under News & Updates. You can follow any responses to this entry through the RSS 2.0 feed. Both comments and pings are currently closed.